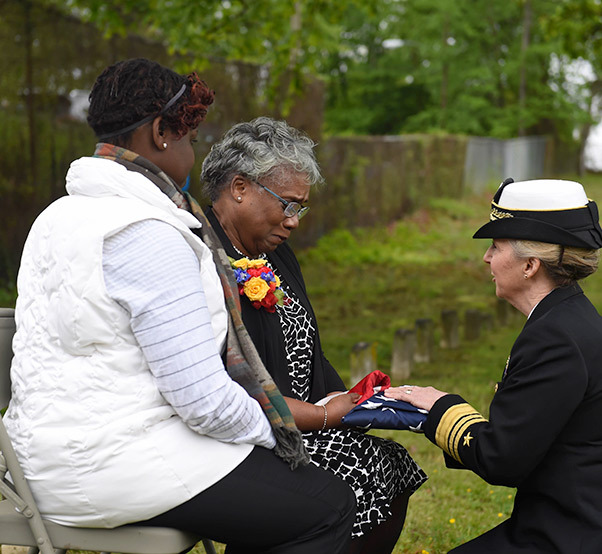 Chief of Navy Reserve Vice Adm. Robin Braun presents the American flag to Bernadette Maybelle Parks Ricks, great granddaughter of Medal of Honor recipient Joseph B. Noil during a ceremony April 29, 2016 at St. Elizabeths Hospital Cemetery. 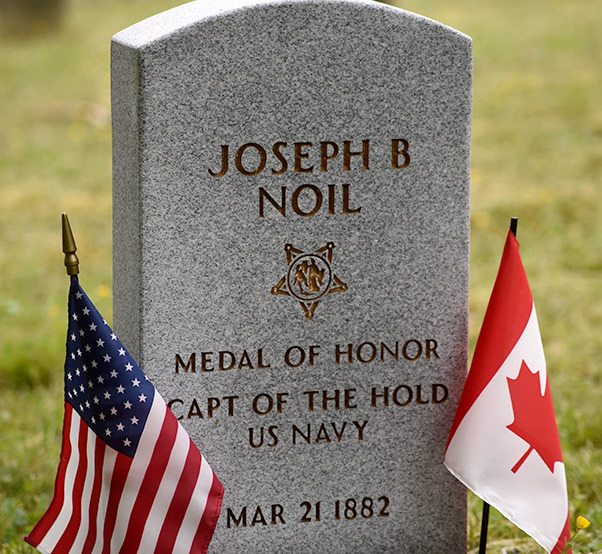 Noil received the Medal of Honor while serving on USS Powhatan, but his headstone did not recognize his award due to a misprint on his death certificate. But until today you wouldn’t know that from his tombstone. In fact, aside from his name, there is no mention of his deed — and even his name is spelled wrong. Likely because of a clerical error on his death certificate, the name on his headstone was originally engraved as Noel. Originally born in Liverpool, Nova Scotia, Canada, Noil moved to America and enlisted in the Navy Oct. 7, 1864, in New York. He served his adopted country until March 18, 1867, whereupon he got out, but he reenlisted Dec. 18, 1871. It was during this enlistment that he earned the medal. Investigations carried out by Galyle Alvarez, Don Morfe and Bart Armstrong of Medal of Honor Historical Society of the United States helped correct the 130-year-old oversight. 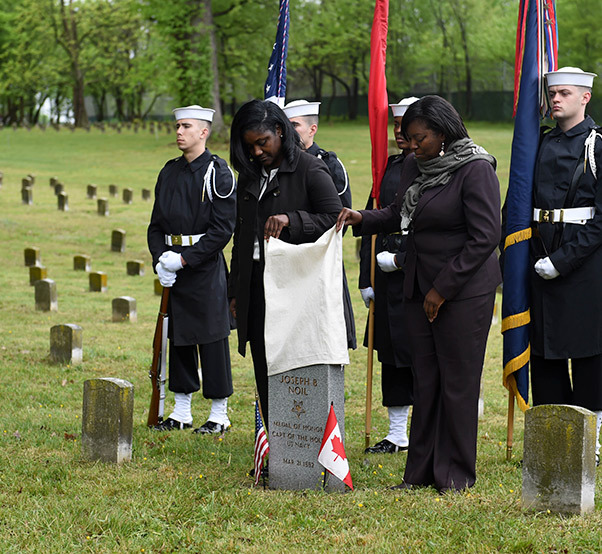 District of Columbia Executive Director of the Mayor’s Office of Veterans Affairs Tammi Lambert, left, and Director of the Department of Behavioral Health Tanya A. Royster, M.D., right, unveil the headstone of Medal of Honor recipient Joseph B. Noil during a ceremony April 29, 2016 at St. Elizabeths Hospital Cemetery. Noil passed away March 21, 1882, at St. Elizabeths. Records indicated that a tombstone was ordered, but due to a typo on his death certificate, the error was later repeated on his headstone. 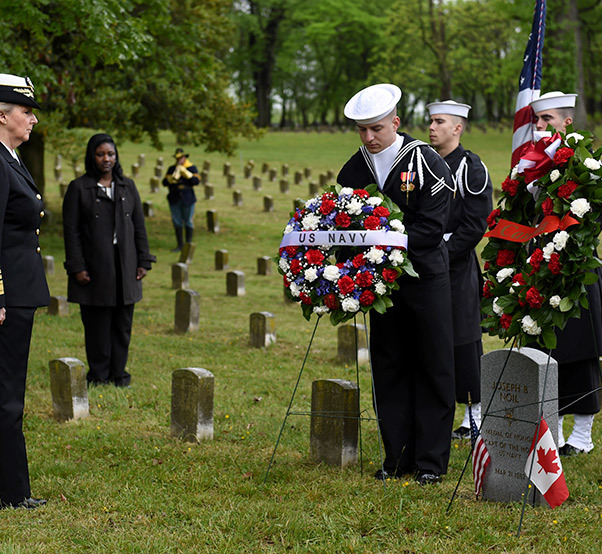 American and Canadian flags are placed at the newly erected headstone of Medal of Honor recipient Joseph B. Noil during a ceremony April 29, 2016 at St. Elizabeths Hospital Cemetery. Speakers also included Chief of Navy Reserve Vice Adm. Robin Braun and Canadian Defense Attache Rear Adm. William Truelove, CMM.